Great list of reminders, especially about visiting a few new blog sites each day and leaving a short message. THanks all for so much love and appreciation ! My new post for H -- "Havoc"
This is a timely post. I don't know what I'm doing wrong this year but comments are a challenge. Blogger won't take my comments, wordpress only sometimes. I cna;t comment during the day because of a firewall at work and my phone doesn't work either. Even when I do manage to leave a comment or tweet the other blogger's post I rarely get a return visit. Feeling sad, disheartened and ignored. Has the A to Z Challenge become so big that commenting etiquette has flown out of the window? Anyway, I'm enjoying the new blogs and if it doesn't lead to more engagement, so be it. I always try to leave a comment and say something about the blogger's post. I will admit, I'm finding it harder than usual to reach out to new participators this year but I do visit every single person who stops at my little niche. Thanks to the A2Z team for hosting another challenging year through the alphabet! H is for Hidden Figures! H is for Hollywood Studios! It's been fun doing A2Z. Yes new people have dropped in and I've found some great new blogs. I agree with Anonymous that it has been difficult to make comments "stick" both at WP and at Blogger. I think it's on the WP end. It's not stopping me from reading and commenting. Check my A2Z, on symbols across the globe, at http://tao-talk.com ! Great challenge. Before this week is done, I will visit and comment on other people's blogs. We can get so caught up in our everyday life and forget about building community friendships. Great post. I've found a couple of new bloggers this time around as always. It is a fun way to learn new things for sure! Well, hello! So far, the A-to-Z has been fun. I'm enjoying visiting new blogs. One of the things I always liked most about the A to Z challenge is getting to meet bloggers outside the book community. And Thanks a Bunch for the reminder. My post for "H" is linked below!! First off, HI all. Second, apologies in advance for taking ages to visit even the people that visit. 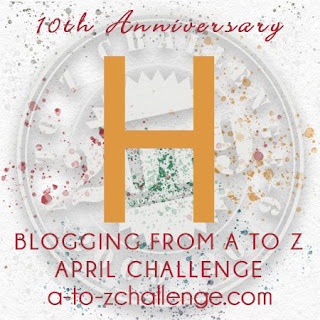 It seems over the years that I have followed so many blogs doing A to Z that I am struggling to get to everyone - well, not until June, maybe August.......2020. Just kidding. I do find commenting thoughtfully on other's post to be hardest part of the challenge. Even now I am keeping a comment short.